Computer Camp Love: Fun Commodore 64 "Nerd Rock"
Some days you just have to wonder how lame life must have been before the internet. I can't get enough of this video! Check it out and please let us know what you think! I can't believe I missed this great article at Next Generation: The Making of Ghostbusters for the C-64. For those of you who haven't played this classic, shame on you--go out and experience what many critics (including this one) take as one of the best, if not the best, ever licensed title ever. Considering that the development team hadn't even seen the movie (at least until the last stages), it's really amazing that this game turned out so well. After all, it would have been so easy to make a cheesy shooter or platform game out of it; anything but a business sim! Cottonwood BBS - Now on Color 64! Last C-64 BBS in America? Cottonwood BBS Headquarters: C-64, multiple disk drives, CMD hard drive, etc.Thanks to The Vintage Computer forums for the heads-up via Andrew's (aka Balzabaar) posting on the Cottonwood BBS. 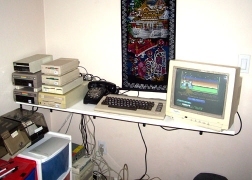 Apparently Andrew still has set up what could quite possibly be the last active Commodore BBS in America and recently updated it Color 64 v7.37, which allows for very visual client displays with the right software on the person's computer who's dialing in. While according to Andrew's Website there's a way to access the site via PC, obviously this is designed for access with a real Commodore 64 (C-64) and either 300 or 1200 baud modem. The nice thing is that you can even download the terminal software directly from the Website (and get it to your real C-64 any of the typical ways). CBMImager for Windows by Uncle Tom and Doc Bacardi of The Dreams has been updated recently. This is a tool to edit disk images. D64 and DFI images are fully supported while there is read-only access to HD images. For those who do not know: DFI is a custom disk archive format used by the DreamLoad plugin for MMC64. While a D64 is limited to 171 KB, a DFI image can be of unlimited size in theory. Furthermore the DFI format supports subdirectories. Dani Bunten's multiplayer trading game, M.U.L.E., is the best family-friendly multiplayer computer game ever designed.